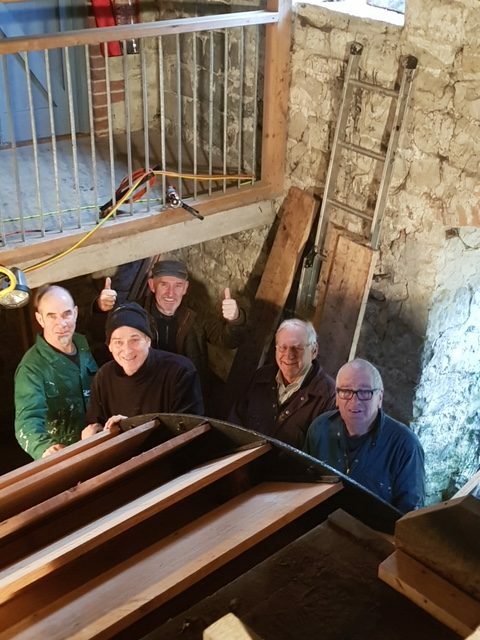 A team of volunteers has completed rebuilding the waterwheel in the Town Mill in Lyme Regis. The work has taken almost four weeks so far and has involved replacing all the woodwork in the present waterwheel. That was installed nearly 20 years ago in the project that brought the historic Mill back to grinding corn after a 75-year silence. The waterwheel which turns the millstones is over 3.96meters (13 feet) in diameter. It consist of two cast-iron rims or ‘shrouds’, originally cast for a mill in south Devon by H Beare & Sons of Newton Abbot in 1878. These are kept in place by sets of eight thick oak spokes or ‘arms’, and hold the 40 broad wooden ‘buckets’ which fill with water to drive the wheel round. In the two decades since last rebuilt, the buckets have started to leak and rot. This waterwheel is by no means the Town Mill’s first. The Mill’s history dates back to 1340 when King Edward III gave the town permission to build a mill and take a water supply from up the river along a new mill leat. (He was the king who also Lyme Regis the ‘Regis’ part of its name.) Originally there were two external waterwheels between the Mill’s north wall and the leat footpath and then later, in the early 18th century, a larger 4.9m (16 feet) wheel superseded the smaller western one. Finally, at the end of that century, the waterwheel was brought inside the Mill to its present position. This was a more powerful 2.44metre-wide, last updated with an all-iron version in 1888. But that and the Mill ground to a halt in 1928. Eight years later scrap-metal dealers stripped out the old waterwheel to make way for an electricity turbine, used to augment the town’s electricity supply. The present waterwheel, built during the Mill’s restoration in 2000, is the same diameter as the old internal wheel but is half the width and uses the cast-iron shrouds recovered from the mill in Devon. About a dozen volunteers have been involved in this month’s work. The include people with professional experience of engineering and wood and metal working, and also enthusiastic amateurs. The work has involved removing all the old timber, cutting and fitting 16 new oak spokes and 120 thick boards of larch to form the buckets. They also had to build two temporary dams to keep the river water away from the waterwheel and volunteers but allow it to continue to power the Mill’s modern turbine which generates electricity to feed into the national grid. Keeping the hydro-electricity turbine running is important because it also generates a modest but significant income to the Town Mill Trust’s finances. The Town Mill is a charity set up to restore and maintain Lyme’s historic mill. If readers would like to contribute to the costs of restoring the waterwheel, individuals or groups can ‘sponsor a bucket’ or ‘sponsor a spoke’. The Trust and Town Mill volunteers will be very grateful.